We feel it appropriate to warn that this camp will be full of problem solving, experimentation, laughing, making new friends, asking questions.. Thinking Feet's Lego EV3 Mindstorm Robotics program is the richest and the most innovative that you will find. We build our own curriculum and design unique challenges you will not find anywhere else. Developed over many many hours of research, development and tested over two years, this program will amaze your child with it's innovative content combining fun and learning....parents tell us that our program challenged and engaged even kids who had bagged prior FLL (First Lego League) contests. 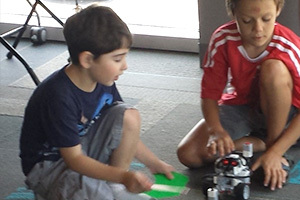 Our Robotics camp will coach campers on many innovative programming strategies and equip them with the toolkit and confidence to program their way through any challenging robotics situation they may face.